- Fur Content: Purple Dyed Sheared Beaver. - Hood Trim Content: Purple Plum Dyed Silver Fox. - Fur Origin: Canada, Finland. .Perfect in Purple! A hooded parka redesigned in a beautiful deep jewel toned purple plum is the new and modern way to enjoy the cold weather. The lush fox trim is an added touch giving an added play on texture and color in this lovely fur jacket. 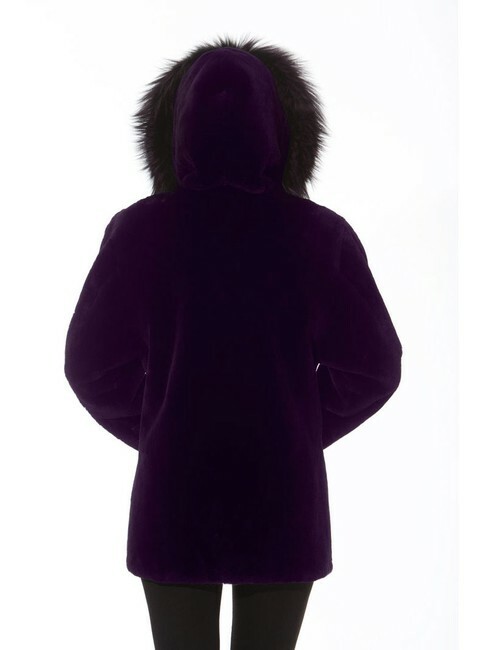 Enjoy this lush, deeply purple sheared beaver in a wonderful mid length parka that works for every day of the winter. The beautiful purple color is so versatile and the sheared beaver keeps you ultra-warm!